American edition first published by SuperiorBooks Inc, New York in 2003. Rarely does fiction capture the essence of human existence with the depth achieved by And All Shall Be Well. The life of Francis Lindsey, like most lives, is marred by personal defects. How he copes with his compulsion to make love to the wrong women is a struggle that runs like a pulsing artery through a series of deeply formative experiences. From orphaned little boy, through the harsh experiences of war, to the ultimate replenishment of his humanity, Francis lives it all. In the end, the reader takes from the book an increased self-awareness and a smile that lasts for days. When my son was in his twelfth year, he came with me on my annual pilgrimage to the German village of Strettle. Always before when he had asked to go, his mother had said, "Not yet - when you are older and can understand." Now he was older, and on this very special day, I was once again visiting the past, this time with my son at my side. In August, the snow-capped mountainsides were green and covered with a carpet of flowers. It was seldom as hot as that summer at the war's end, but in the valleys the air was warm and still. I always left the airplane at Vienna to finish my journey by train, soothed by the gentle clackety-clack of the wheels as it wound through the beauty of hills and valleys to the small station a mile or so short of my destination. Old Wilhelm with his ancient taxi and wheezy greeting of 'Grüss Gott, Gnädige Herr!' would be at the ready, as he had been for so many years, to cover the last lap from Manheim to the white-painted Inn at Strettle. I rested my head against the dusty seat and watched my son, wondering if perhaps we should have made him wait another year or two. There was no secret about my yearly return, first to Austria, then on to Germany; he had grown up with the knowledge of what had happened there to make it a special place. But hearing about something and then meeting the reality were two very different things. What would he feel, this child of peace, and would he care? Perhaps, I thought, this time he should stay in the village and not visit the other place. He wriggled suddenly and scratched the backs of his bare legs. "Dad, these seats make me itch! Is it much further?" "Only another half-hour or so." I closed my eyes, letting the swaying of the train take me back to another journey made almost thirty years before. Then the train had rattled over the miles, sweeping through the red earth of Devon towards Cornwall and putting in motion the events that were to lead me, less than a decade later to a lush green valley in Austria. 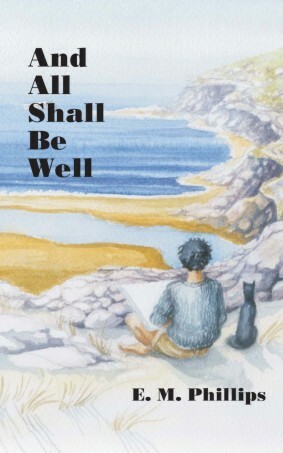 And All Shall Be Well is the first of a trilogy of novels and follows Francis Lindsey's journey through childhood to middle age; from a suddenly orphaned ten-year-old to an established artist. Taken on by his Aunt Emily, a sixty-something spinster, aided and abetted by the somewhat anarchic old priest, Father Con, Francis receives an unconventional and frequently exhilarating upbringing. One which helps prepare and support him in his wartime role of interpreter in a recently liberated German Work Camp, and his ultimately tragic first love affair with an Austrian survivor. How the aftermath of the Holocaust helps shape his life and loves; his struggles to be faithful to the woman he eventually marries and his progress as an artist is the core of the book. It is a story about friendships, relationships and journeys, suffering and personal growth, courage and weakness, guilt and reparation, set mainly against the dramatic background of the Cornish Coast. Eve Phillips was born in London but, at an early age, moved to Epping Forest in Essex. She now lives in Hampshire, and has three children and six grandchildren. She has written two more Cornish-based novels which, with And All Shall Be Well, form an engaging trilogy.